Dexter Daily: Michael C. Hall Teases Dexter Finale: "There Will Be Some Interpretation Left For People to Debate About"
Michael C. Hall Teases Dexter Finale: "There Will Be Some Interpretation Left For People to Debate About"
via NBCnews.com: Possible spoilers ahead: While star Michael C. Hall is tight-lipped about how the story of his beloved vigilante serial killer might wrap up, he did say that there will be some finality. "I don't think the ending will leave any huge questions in the air like 'The Sopranos' did in terms of 'What was the next frame?' or 'Where are we headed?'" the actor told reporters at a press roundtable in New York on Friday. "There will be some interpretation left for people to debate about. ... There will be a pretty broad spectrum to the response: Some people will be satisfied, some people will wish it had gone down differently, some people will be both of those things!" When asked what the final episodes would be like, he declined to answer, but compared them to a roller-coaster ride. "All aspects of all the best roller coasters," he told TODAY.com. "Loops, hills, unanticipated turns, tunnels, upside-down sections, yep!" One of the biggest loops this final season has Dexter Morgan trying to build a real relationship and life with lady love — and fellow murderer — Hannah McKay (Yvonne Strahovski) while still killing when he feels it necessary. And there is the matter of investigator Elway (Sean Patrick Flanery), who is hot on the trails of America's Most Beautiful Fugitive, Hannah. Will the lovebirds be able to escape and start a new life, happy together? Read the rest after the jump. Hall wouldn't say much about where things will go, but did reveal he thinks Dexter deserves a happy ending of sorts. For the killer, that would mean being "released from his compulsion," the actor said. 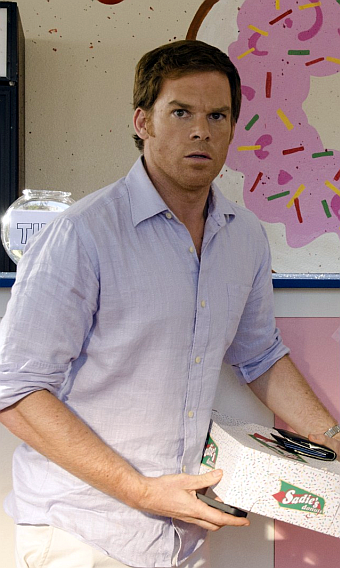 "Dexter, at different points over the life of the show, found himself entertaining the idea that he could be rehabilitated, that he could live a life that isn't primarily in service of his Dark Passenger. ... But things have happened that have taught him at least temporarily, and maybe more permanently, that that's not a possibility." If it feels a little strange that Dexter's potential happiness may lie in whether Hannah — and not Miami Metro's blood spatter analyst — gets caught, Hall admits that maybe the show did burn that story line a little too early. "We definitely spent a good amount of storytelling capital in that second season," he said of the police trying to track Dex (aka The Bay Harbor Butcher) down in the show's sophomore season. "The second season starts, and bloop! The bodies surface! But yeah, that's something that could've happened later in the game." However things wrap up, they are coming to a close, and Hall is ready to say goodbye. "I'm sad in some ways that it's ended," he said. "At the same time, I don't think I'd have it any other way. It's time to let go."